Come join in the adventure that is the dawn of Humankind! Will your tribe journey far and fast ? Will they surmount the pain dangers of this world ? Will they bring you victory and survival ? 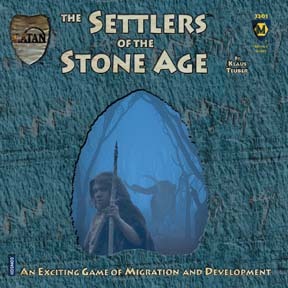 Are you ready to play in this newest creation of Master game designer Klaus Teuber Based on the award-winning Settlers of Catan game system, but presenting players with all-new challenges unique to the dangers and opportunities of the Stone Age. This is a great twist on the Catan games. Fixed positioning of the numbers and starting positions takes away the significance of choosing your first settlements - which often decided the other game before it was is even played. Well-made and well-designed, this game is a must for gamers, those new to the Catan games and veterans.